These candelabra were conceived to be placed in from of the pier glasses in the State Dining room at 10 Downing Street. Hamilton and Inches Limited was founded in 1866 and holds the Royal Warrant from HM The Queen as silversmith and clock specialist. Their silver workshops were founded in 1896 and have a reputation for their quality of workmanship. 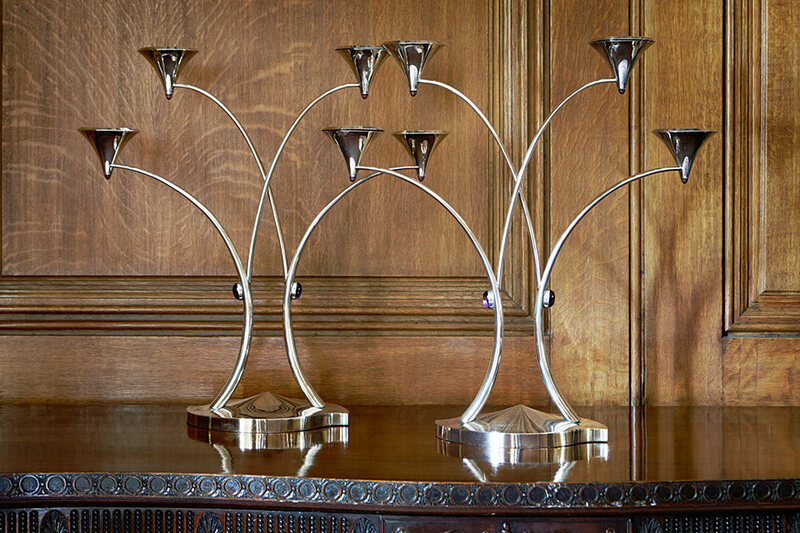 The Company’s craftsmen at the time, Jon Hunt, Panos Kircos, Stan Smith, Colin Golder and designer Nicola Williams, were responsible for the production of the quaichs and later the candelabra for The Silver Trust. Hamilton and Inches has long been a unique source in Scotland for the finest Highland Dress ornaments and Scottish tableware.